Have you ever wanted to remove over or under qualified people from your talent search? Three new "experience" filters in LinkedIn Recruiter allow you to do just that, giving you the ability to zero-in on the right people. In addition, you are also able to narrow your search results based on candidate membership in various LinkedIn Groups. That is for all public groups on LinkedIn and not just the ones you belong to. The Search Refinement Filters provide true guided navigation right in search results, reduce the need for boolean, and provide a powerful and dynamic summary of your search results. 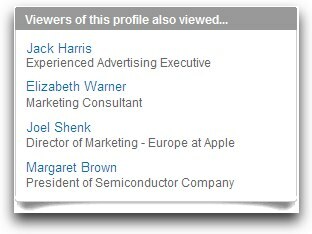 Now you can use the power of the LinkedIn network to find profiles that may not have come up in your search. Once you have found a good match for your project, you can now see what members who viewed that profile also viewed, bringing you more suggestions of profiles you might have not searched for. As you can see we remain committed to bringing you the most powerful ways to precisely find the right candidates faster on LinkedIn, with Recruiter's enhanced talent search. We trust these enhancements to our online recruiting solution will help you hire more and better top talent. You can read Boolean Black Belt's review of these new filters.